We are the Business School of the future for global thinkers, international leaders, hidden champions, and local players. Whether you are interested in an education for your entire company, specifically selected employees, or yourself we have a program for you. Our wide range of offerings include Company Specific Training, the Global Executive MBA, Short Programs, Events and beyond, all designed exclusively to meet the individual needs of our clients. 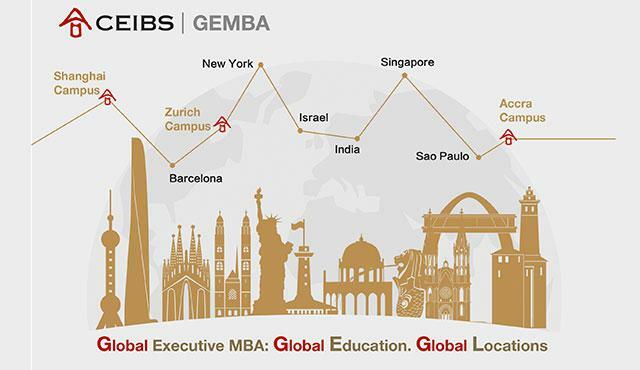 Truly Global - CEIBS Global EMBA is an extraordinary Executive MBA program ranked Top 20 internationally and offered by a Business School accredited by AASCB and EQUIS. The 20-month, part-time program has long-lasting results with a strong return on investment. With executives participating from three continents, studying at and beyond our five locations, the alumni network is truly global. Learning Journey - The CEIBS Global EMBA is designed to help executive-level participants master business fundamentals and build strategic capabilities within their organisations. With a focus on Accounting & Finance, Marketing, Economics & Decision Sciences, and Management, the curriculum integrates business knowledge and concepts across these functional areas to diagnose and solve complex business problems in an international context. You will learn and apply appropriate leadership behaviour and skills for enhancing personal and organisational effectiveness.